The objective of this project is to present the scalability of CFD simulations on IT4Innovations parallel platforms and calculating external aerodynamics around the VSB-TUO formula student car (lift and drag coefficient calculation). Formula Student is a student engineering competition. Student teams from around the world design, build, test, and race a small-scale formula style racing car. The cars are judged on a number of criteria. One of the criteria being evaluated in this competition is engineering design, the quality of computational simulations etc. This project will be focused on the application of Open Source Field Operation and Manipulation of C++ libraries (OpenFOAM) for solving engineering problems on parallel platforms. OpenFOAM is a free, open source CFD software package developed by OpenCFD Ltd. at the ESI Group and distributed by the OpenFOAM Foundation. It has a large user base across most areas of engineering and science, from both commercial and academic organisations. The parallel scalability of OpenFOAM with various setups of linear solvers implemented in OpenFOAM (PCG, GAMG…) will be tested to find the optimal solver settings for the IT4I clusters. For lift and drag coefficients evaluation, a variation of different types of turbulence models will be tested. Project Mentor: Ing. Tomáš Brzobohatý, Ph.D.
Project Co-mentor: Ing. Marek Gebauer, Ph.D. 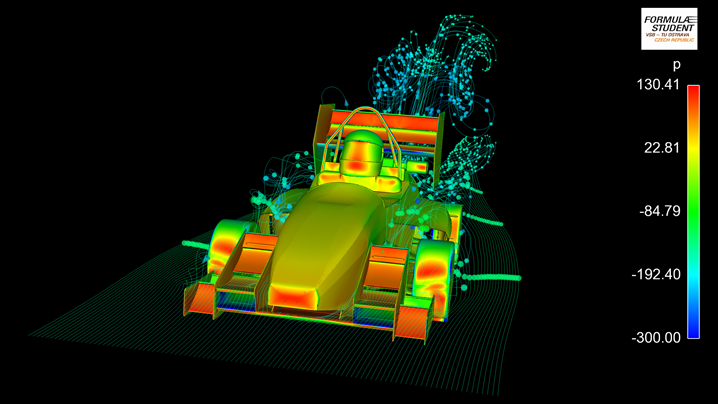 Parallel CFD simulations for car external aerodynamic based on an open source solution. Formula student external aerodynamics CFD simulation with parallel scalability report. Programming a new boundary condition in OpenFOAM, create automatized meshing and solver utility as the formula student team needs. Work with one turbulence model only.